In 2009, the Coppell Police Motorcycle Unit decided that they wanted to pay tribute to the ultimate sacrifices of two Coppell Officers. Those officers were Officer Donald Swearingin and Officer Michael Johns. Watch Donnie Williams at last year’s competition – Unbelievable! The unit decided to honor their memories with a memorial wall. 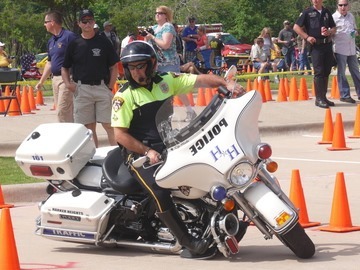 The unit was approved to host the First Annual Coppell Police Motorcycle Competition and began fundraising and contacting departments. Through their efforts, they found local citizens, business owners, and officers that donated their time, money, and efforts. Today, the wall stands in honor of those fallen officers. The rodeo hosted twenty five officers and hundreds of spectators. With encouragement from the city, the rodeo continues today. In 2010, the rodeo hosted thirty five officers from as far away as California. They also chose to support MetroplexCOPS.org as the benefactor. With the efforts of the Coppell police motorcycle unit and the generous donations of citizens, business owners, families and friends, they were able to raise and donate $12,000. In 2011, they hosted their third annual rodeo with an attendance of 45 officers and thousands of spectators. They were also able to raise $14,000 for MetroplexCOPS.org. The 2012 rodeo was the biggest and most successful rodeo yet. In 2012, there were competitors from Lenexa(KS), Beaumont, Tyler, Harker Heights, Houston and all over the DFW area. The rodeo was also attended by an estimated 4,000 spectators. The Coppell Police Department was able to donate $20,000 to Metroplex C.O.P.S. (Concerns of Police Survivors). MetroplexCOPS is run by surviving spouses, parents, siblings, and children. Next post: “Arctic Cat” – Awesome Off-Road Fun!